After almost a month of non-use (of my Windows laptop) Windows or Studio has done something to me. Again. Studio 6.2 is not recognizing my Dragon. Again. The OS is Windows 10. While I was working, new files for an update were being downloaded and installed, awaiting a reboot. Neither before or after the reboot, is the Dragon recognized. A month ago, it worked. No upgrades have been done to Studio in that time. Windows shows the Dragon as a "connected device" but Studio does not detect its presence. I did the most recent Studio USB driver fix back in October - extensive Freaks thread (at https://www.avrfreaks.net/forum/a...). Jim, do you have Bluetooth turned on? Try turning it off. I cannot find any reference to BT on this computer, which really surprises me. In the settings, there is a section for "BlueTooth,Printers" but no reference to BlueTooth inside that or anywhere else. There are network adaptors for ethernet and WiFi but nothing else. I've looked and looked, to no avail. And Studio still does not recognize Dragon, though the computer does and even says that it is an Atmel device. No upgrades have been done to Studio in that time. What about an invisible, behind the scenes, WE control the horizontal, WE control the vertical update(s) to Visual Studio? Hi Greg - I have to plead ignorance, here. Everyone: I just reinstalled the USB driver referenced here: https://www.avrfreaks.net/comment... Also checked that the Studio6.2 codeCache folder still contains wdapi1010.dll. No change in behavior after system reboot! AVRDRAGON is still recognized by the OS. Replaced the wdapi1010.dll file with a copy from the original download back in September, rebooted the system, again NO CHANGE! I think what Greg is saying (using an outer limits reference) that since you are using Win10 you may have had an update to Visual Studio without knowing from it, thanks to the M$ control of everything. HoKay! I had no idea that M$ would do that, but, then again, it does not surprise me. That leaves me dead with respect to Studio 6.2 and programming/debugging. I have a couple of choices at this point, and getting a bit desperate as I have some "product" that has to be delivered on Monday. 1. I tried AVRDUDE (following the guide at http://m8051.blogspot.com/2015/0...), but seemed unable to connect to DRAGON (my interpretation of the cryptic error messages). 2. I have a JTAGICEmkII. Studio does not recognize that either, while the OS does. No help here! 3. Install Studio7. That scares me, given the short time frame and the reports of difficulties importing Studio6 projects. 4. I have a pocket programmer from AlanK2 - but the configuration is a bit complex (of course, that makes it versatile) and I am never quite sure that I have it "right". My next try will be the pocket programmer because I have been successful with it. Least unpleasant of a bevy of unexciting alternatives. I WILL try Studio7 after I get this delivery out. Other alternatives, suggestions? How about a big charge of TNT? My experiences may not apply here because I use Atmel Studio 7 but they may help you nevertheless. 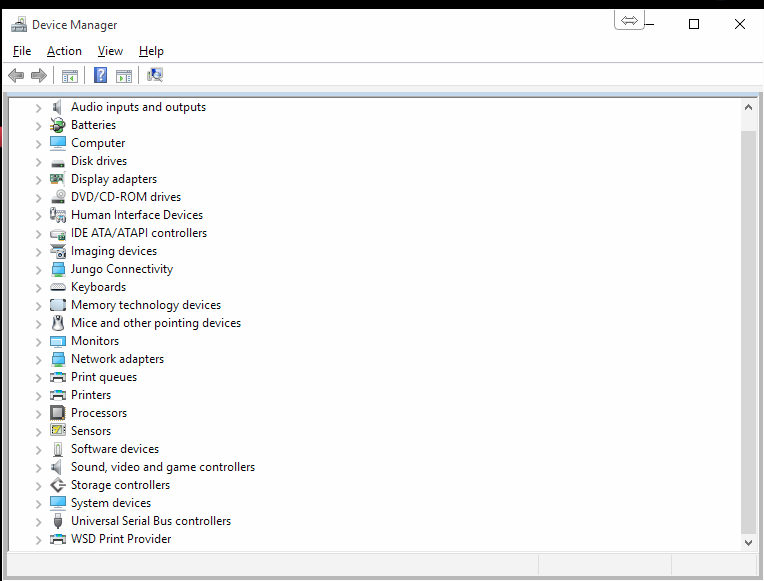 - removed all Jungo/Atmel related drivers in Device Manager. I also selected the "remove driver files" flag when doing this. I will probably try that before I try Studio7. Not being a Windows expert (more of a Mac person), some of this is slightly intimidating, but I will figure it out. As a last resort, you could try AVRDUDE on the Mac. And before you do what I wrote above you should unplug your Dragon from USB before and only plug it in after you completed the re-installation. It is not too difficult btw. You get to the Device Manager by right clicking the Start button in the task bar and selecting "Device Manager". You see a tree structure and as part of it "ComputerName->Jungo->..." all the atmel drivers (3 for me). Just right click each of them again and select "Uninstall driver..." and tick "remove driver software from device" and then OK.
You open the Control Panel the same way (right click on Start Button, select Control Panel etc.) In the window that opens you'll find something like "Uninstall programs". Select it. The list that appears can be sorted by issuer. This way you have everything from Atmel together and remove it one after the other. Just installed Studio7. It ALSO does not detect Dragon or JTAGICEmkII. The operating system still DOES detect them. Will try some more tricks like restarts. <edit> Did multiple reboots and AS7 restarts, with DRAGON connected on boot-up and NOT connected until program was running. No difference. A few weeks ago we were on site about to do a firework display (my other job) and needed to alter the firing script. The firing box has a serial connection over USB, implemented IIRC using an FTDI chip. We plugged in the work laptop and fired up the software but it wouldn't find the firing box. The port was listed in device manager but the script software just wouldn't connect. The laptop runs W8.1. As I'd used my own laptop a couple of weeks previously to make some script changes on another job I pulled it out as I knew it worked. It didn't. This one runs W7. Same symptoms. Once the panic had subsided, and after trying a few things, I turned off Bluetooth on my laptop and it all sprang into life. Why turn off the Bluetooth? Because a while back I came across an issue with the Arduino IDE where it would take an age to connect if Bluetooth was on. The solution was an updated rxtxserial.dll. Basically, the 'virtual serial port over Bluetooth' was taking too long to respond and was causing a timeout while scanning for serial ports. Turning off Bluetooth solved this as did altering the COM port number of Bluetooth so as to be higher than the USB serial ports so that the software found the port it was looking for first. The odd thing is that I can no longer reproduce the problem. My suspicion is that there has been a windows update since, on both W7 and W8, which fixes the problem. Many programs that scan for the 'right' serial port start at COM1 and interrogate upwards from there. If the error handling isn't spot on for when a port doesn't exist, takes too long to reply, or sends back the wrong response then there may well be problems. So, my advice to anyone having connection problems over USB serial ports is to try turning off Bluetooth or move it to a higher COM port number. This oddity may well occur with other types of virtual serial ports not just Bluetooth. I am having the same problem, my AVR Dragon and AVRISP mkii are recognised by the computer and I can see them in device manager under Jungo. However they are not seen in Atmel Studio 6.2 or Atmel Studio 7 which i've tried reinstalling. I think I will try Bernd's description, above, next. Not much to loose! Maybe 8 hours from now. <edit> Brian - where is BlueTooth listed in the Control Panels, when it is present? where is BlueTooth listed in the Control Panels, when it is present? Mine appears down in the system tray but the virtual serial port appears in device manager. The screenshots are from my desktop machine where I haven't re-assigned COM port numbers but if I was doing it I'd be setting all those 'serial port over bluetooth' to live after the usb serial port. My Device Manager looks very little like Brian's! This is Win10, HP Laptop. I've looked in every category that seems even half-way applicable. Especially Computer, Network Adaptors, System Devices. Just tried plugging in a USB Virtual COM device. 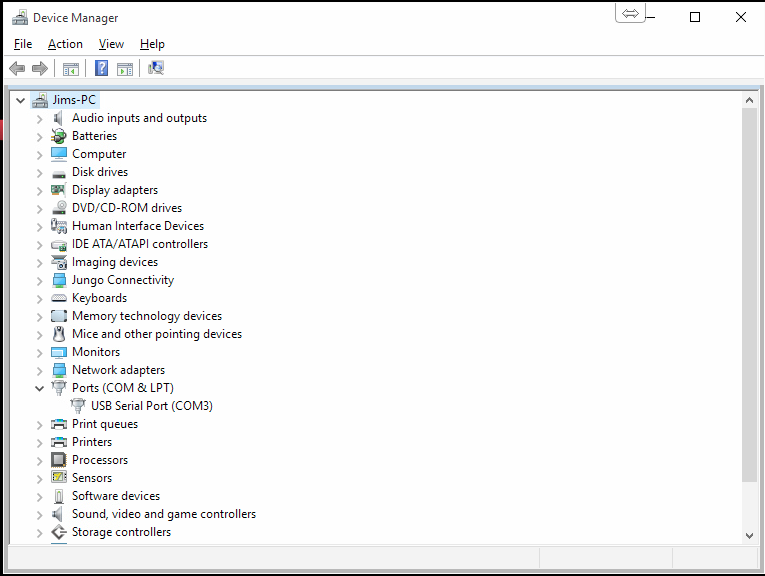 Then I got a Ports entry in the Device Manager with one item which is the one Virtual COM Port. I KNOW that there are no built-in RS232 ports nor any built-in LPT ports. I can assume from this that the machine has no BlueTooth. Did not think much about BT when I bought it as I use it very little. So, I suspect that Brian's "solution" is not related to what is happening here. Bernd's suggestion seems like the only option remaining. Success with Bernd's "complete reinstall" method worked for me. Hello, Just wanted to say the complete reinstall worked for me as well. I had same issue with fresh install of tool. I restarted the computer and then was able to connect tool to AVR Dragon. Tool then allowed me to upgrade the FW. Dragon working fine.